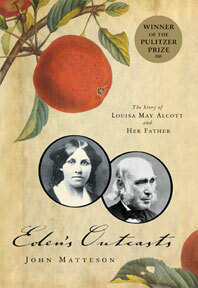 Louisa May Alcott's name is known universally. Yet, during her youth, the famous Alcott was her father, Bronson—an eminent teacher, lecturer, and admired friend of Emerson and Thoreau. Willful and exuberant, Louisa flew in the face of all her father's intricate theories of child rearing. She, in turn, could not understand the frugal life Bronson preached, one that reached its epitome in the failed utopian community of Fruitlands. In a family that insisted on self-denial and spiritual striving, Louisa dreamed of wealth and fame. At the same time, like most daughters, she wanted her father's approval. As her father struggled to recover from a breakdown and slowly resurrect his career, Louisa learned to support her family, teaching if she must, but finally finding her vocation in writing. This story of their tense yet loving relationship adds dimensions to Louisa's life, her work, and the relationships of fathers and daughters.